We have been a Tourist Board, 4 Star graded establishment, since we started providing Bed and Breakfast, some seventeen years ago. 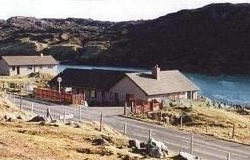 The house is situated on the family croft, with a southerly aspect over West Loch Tarbert.Two of the bedrooms and the lounge, have extensive views of the loch. Birdwatching is a popular pastime and we are ideally located, whatever the time of year. Please view the rest of the site and get a taste of the Hebrides. Less than an hour's drive from the Calanish Stones, to the North and half an hour to St Clement's Church at Rodel, in between are the majestic hills of North Harris and the golden sandy beaches of Luskentyre, Seilebost and Horgabost. Please let us know your needs and questions, we will be more than happy to help. We look forward to sharing our knowledge and appreciation of this wonderful island, with as many people as possible, across the world. To get here from the ferry terminal, follow the A859 towards Stornoway. We are approx. 3/4 mile, on the left hand side, just as you leave the village. If arriving from Stornoway, then we are the first house in Tarbert and if travelling by bus, just ask the driver for Avalon. If you intend arriving by ferry into Tarbert and have no transport, let us know and we will pick you up from the terminal.